Shenzhen Cloud Hub Network Co Ltd unveiled version seven of its mobile office platform during its 2016 Strategic Conference in Beijing on May 30. Wang Shi, chairman of Vanke, China's largest residential real estate developer and a longtime partner of the company, showed attendees how to use the Cloud Hub technology at the conference. Mobile Internet is changing people's lives, inclusive of the commercial environment. The 4A (Anywhere, Anyone, Anytime, Anything) method brought by mobile Internet has already penetrated all aspects of business and social life. Today, mobile Internet has become the most dominant driving force behind the evolution of traditional industries and economic and social development. Founded in 2010, Cloud Hub has become the No.1 brand in the mobile office platform software market by pairing the highest quality professionalism with a great product. It has made astounding advances in the industry and is committed to the further innovation and development of its platform. Tian Rongju, the CEO of Cloud Hub attributes the company's outstanding performance in the market to its unique competitive advantages and being highly attuned to the user's needs. He said meeting the needs of their consumers is paramount. "We are committed to improving our service to customers through research and development an technology innovation," said Tian. 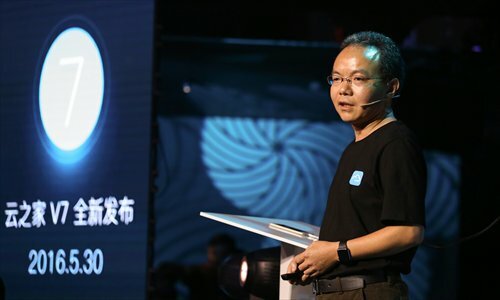 He added that Cloud Hub currently has 20 million users and 1.8 million cooperative enterprises, including large enterprises like Vanke, Haier, and LeTV, and will continue to work to bring them more excellent, innovative services. Cloud Hub's product allows users to organize, socialize, search for information, and accesses third party partners through its app center. It strives to provide enterprises and clients with abundant mobile office apps. It can also help businesses and teams increase efficiency in communication and cooperation by breaking down geographic barriers. Always forward thinking, Tian has tabled a strategy of "ecological development," which will be instrumental in keeping the company ahead of its competitors. He said Internet platform ecosystem integration will be realized by mobile Internet platforms in the future. "The era of mobile Internet is an era of enterprise value chain integration. The integration of value chains and ecosystems will spur traditional industries to adjust their structure and innovate the way they manage, forming the core competitiveness," Tian said. "As an open platform, Cloud Hub wishes to unite more partners ecologically to foster mutual benefits, mutual acceleration, and co-existence." Having worked in the industry for more than 20 years, Tian brings his own management philosophy to the workplace. "I appreciate simple work environments and relationships," he said. Tian thinks every employee should be able to enjoy a simple and relaxing work atmosphere. For example, he loves job flexibility, so, instead of requiring that his employees only work from 9 am to 5 pm, he has allowed them to arrange their hours according to their schedule. He also allows them to dress casually at the office. "I communicate with my teams very often, and I encourage them to have dreams and to pursue them, for one may not have the drive to do the best unless he has a goal," Tian said. "I also love to share my own ideas with my team, which cultivates a stronger sense of identity and trust."